Police have shot dead a knife-wielding man in Islington. Tottenham Court Road is getting a £125 million cancer centre. Parents of children at a Catford school have been banned from entering the playground. London Fire Brigade gives tips on how to spot a fake iPhone charger. Transport for London has paid its own special tribute to the great Joan Rivers. This week's other London rail news. On the subject of funny messages, a London School of Economics balls-up means 200 students are apparently called Kung Fu Panda. Brixton Tesco selling blue Bantha milk, and Melange from the planet Arrakis. Tooting pie and mash shop to stage Sondheim's Sweeney Todd. Eat before you come out. Ying tong iddle I po! Finchley has finally got its Spike Milligan statue. 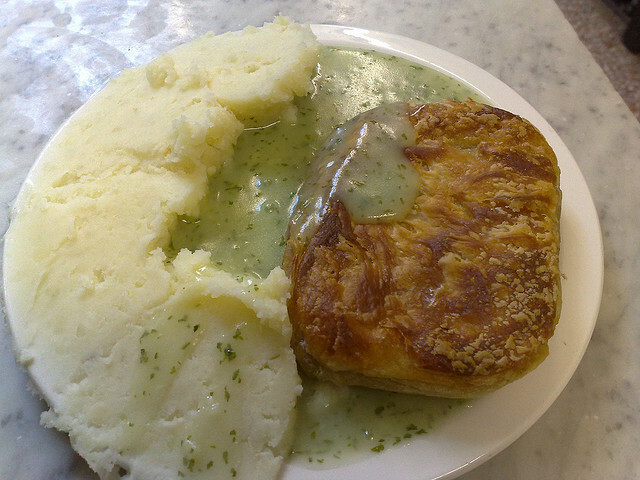 Image of a rival's pie and mash by secretlondon123 in the Londonist Flickr pool.